Definition at line 26 of file CSimSummaryInfo.h. Definition at line 20 of file CSimSummaryInfo.cpp. References mMaxOverallConcentration, mNumberOfReactants, mNumberOfSteps, and mTotalTime. Definition at line 28 of file CSimSummaryInfo.cpp. Definition at line 48 of file CSimSummaryInfo.cpp. Definition at line 45 of file CSimSummaryInfo.h. Definition at line 58 of file CSimSummaryInfo.cpp. Definition at line 46 of file CSimSummaryInfo.h. Definition at line 43 of file CSimSummaryInfo.h. Definition at line 42 of file CSimSummaryInfo.h. Definition at line 41 of file CSimSummaryInfo.h. Definition at line 47 of file CSimSummaryInfo.h. Definition at line 36 of file CSimSummaryInfo.cpp. Definition at line 42 of file CSimSummaryInfo.cpp. Definition at line 35 of file CSimSummaryInfo.h. Referenced by getMaxForSpecies(), operator<<(), and storeMax(). Definition at line 34 of file CSimSummaryInfo.h. Referenced by getMinForSpecies(), operator<<(), and storeMin(). Definition at line 32 of file CSimSummaryInfo.h. 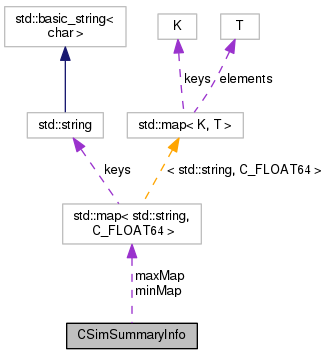 Referenced by CSimSummaryInfo(), getMaxOverallConcentration(), operator<<(), and setMaxOverallConcentration(). Definition at line 30 of file CSimSummaryInfo.h. Referenced by CSimSummaryInfo(), getNumberOfReactants(), and operator<<(). Definition at line 29 of file CSimSummaryInfo.h. Referenced by CSimSummaryInfo(), getNumberOfSteps(), and operator<<(). Definition at line 31 of file CSimSummaryInfo.h. Referenced by CSimSummaryInfo(), getTotalTime(), and operator<<().